Practice self-love with Sacred Feminine tips on how to love yourself from Goddess Coach, Healer and Author Syma Kharal. 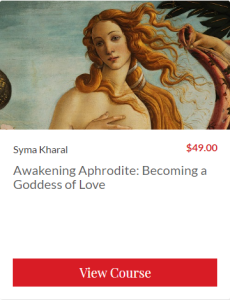 Syma shares Goddess coaching and Divine Feminine archetypes (Kuan Yin, Sekhmet, Pele, Brigit, Aphrodite, White Tara) to help you heal self-love wounds and learn how to love, honor, trust, empower and respect yourself. She teaches that when you love yourself, you clear blocks, and manifest love and miracles with ease and joy. To receive my one-on-one sacred feminine and spiritual support, you may book a live Skype Goddess Coaching Session and inquire about my private program, “Heal and Transform Your Greatest Inner Blocks” if you are ready for real transformation. Join our Monthly Goddess Circles for more in-depth support and sacred sisterhood. It’s all about Love in February!